NASA astronaut Peggy Whitson smiles as she listens to a reporter's questions ahead of final qualification exams at the Gagarin Cosmonaut Training Center (GCTC) in Star City, Russia, for a launch to the International Space Station with the Expedition 50 crew. Whitson will launch on a Russian Soyuz rocket on Nov. 17, 2016. NASA astronaut Peggy Whitson — who will become the first woman to command the International Space Station twice — shares her experience as an older space traveler in a new YouTube video for the AARP provided exclusively to Space.com. Whitson will launch back to the space station on Thursday (Nov. 17) on Expedition 50, along with crewmates Oleg Novitskiy (Roscosmos) and Thomas Pesquet (European Space Agency). She will take command of the orbiting lab's Expedition 51 mission in 2017. "When I got back from Expedition 16 [in 2008], I became chief of the [Astronaut] Office," said Whitson in the video, speaking of a NASA management role that requires staying on the ground. "It was actually a very satisfying job, but I did know that I still wanted to fly again — at least, I was not willing to say I didn't want to fly anymore. So that's when I stepped down to get back in line [for a flight]." Whitson's accomplishments to date include two six-month flights in space (Expeditions 5/6, and Expeditions 16/17). She accumulated 377 days in space so far, the most for any woman. Whitson has done six space walks, and she kept her taste for spaceflight despite an off-target, high-G force landing in 2008. In recent years, she was an advocate for changing lifelong spaceflight radiation guidelines for women, which she said are discriminatory since women hit limits quicker than men. Her time working in space extends back to even before she was selected as an astronaut in 1996. Some of her previous roles include project scientist for the shuttle-Mir program and payload element developer for a bone cell research experiment on NASA's STS-47 space shuttle mission. "I definitely am a different astronaut now. 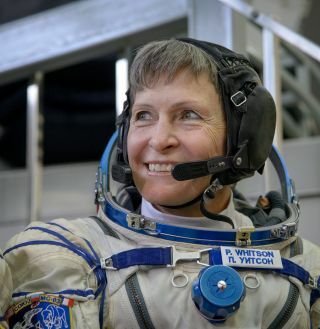 I have a much bigger-picture perspective," Whitson added, citing her spaceflight and management roles. She said she is using that perspective to help people such as her crewmate Pesquet, who will make his first flight in space by her side.